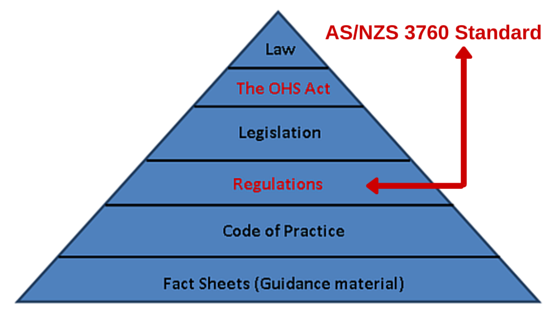 The AS/NZS 3760 is an Australian Standard that oversees the Test and Tag industry in regards to electrical safety of portable appliances. Its main goal is to ensure workplaces are safe by setting out recommendations in relation to testing 240V, 3 phase and low voltage electrical equipment. Specifically, these recommendations focus on topics that range from Test and Tag frequencies, inspection and testing specifications, record keeping and other general guidelines. This extends to any equipment or appliances brought into the workplace i.e. battery charger, laptop chargers, electric drill etc. If the equipment is not safe and causes an accident, both the employer and the person who provided the appiance may be liable. In addition, AS/NZS 3760:2010 stipulates the requirements a person needs to fulfil to be considered a Competent Person - a necessity for someone who wants to Test and Tag. Although we have a National Standard to follow, within Australia we also have the respective State/Territory Regulator Bodies that are responsible for ensuring that organisations comply with the requirements. If you're actively testing and tagging, it's important you have a clear understanding and stay up-to-date with any changes to AS/NZS 3760. As some topics can be difficult to interpret and sometimes misunderstood, we're happy to help explain any parts you're unsure about. Call us on 1300 848 302 if you would like any clarification.